Situated in the southern part of new Nessebur and close to the popular beach the hotel Bilyana Beach is a welcome addition to our programme. Offering comfortable accommodation, a good selection of facilities and a friendly service. Hotel Bilyana Beach is excellent value for money. The hotel itself is modern and extremely well kept, from the hotel rooms through to the gym and inside pool area. It's location towards the end of the resort along the beach in New Nessebar worked well for me as there was little through traffic and remained quiet throughout our stay. Hotel staff were professional and friendly and no request appeared to be too much trouble. Only big let down was the food. Had read that breakfast was good, but we found it to be only average. The Bulgarians apparently eat their food warm rather than hot, but the hot breakfast was definitely cold - e.g. cold bacon, baked beans, fried egg and cheese on toast! However, the alternatives, cereal, yoghurt, fruit, toast and various honeys and preserves were fine. Coffee is strong and tea requires two tea bags per cup! We were booked half board but having sampled the meal on the first night decided to sacrifice the extra cash paid in order to eat something that resembled quality food. All in all the hotel is certainly worth coming to, but avoid going half board - there are a number of various restaurants in Old Nessebar with absolutely delicious food on offer. Location of this hotel is exelant for all the atrctions in the area. Rooms are very clean, we found the staff very helpful. There was no entertainment at the hotel, but Steve the rep has a large selection of day and night trips if this is what you are looking for. Overall this was a very nice relaxing holiday, hotel in right on the beach with two pools one indoors one outdoors exelant gym (not for me). The only let down was the food, breakfast ok both hot and cold diner very very poor. Best to eat out lots of choice plus so very cheap. We found the hotel to be clean and in an excellent position on the beach. The staff we met were all very helpful and friendly, especially Maria behind the desk. Breakfast was ok with both hot and cold meals and gave a good range of choices for this level of hotel. We were impressed with the quality of the soundproofing of the patio doors which cut out a lot of the 'usual' resort noise. We stayed at this hotel for two weeks and go back again next year. We enjoyed the relaxing atmosphere throughout the day and night. The beach is only a few steps away from the pool so pleased the kids through the day, it was a brilliant location. We had breakfast each morning at the hotel which was lovely, the staff were great, the hotel was very clean- maid service every day who couldnt do enough for you. There is no entertainment but the town is only a 15 minute walk away where theres lots to do. The hotel is right on a terrific beach but has a tidy pool to laze around. Second visit to this hotel. The standard is excellent, food has improved by 100%,but still no entertainment, maybe I was too early in season. Best room in Hotel is 108, although they are all good. The hotel has only been open for just over a year and is favoured by wealthy Bulgarians, weddings etc. Return guests are made especially welcome. Hotel location was excellent, room was spacious and had a view of the pool and the sea. Could not fault the hotel on cleanliness. Staff were friendly and helpful. We were not originally booked into this hotel, it was a last minute change by the travel company. The only negative point was the food, breakfast was acceptable with the choice available but the half board evening meal was very poor and quite a few complained. We had a meal in the hotel restaurant and it was very good, also had lunch on a few occasions and no complaints. Would go back but would stay B&B. The brochure said there was a night club and shops, this was not the case but it was not an inconvenience. 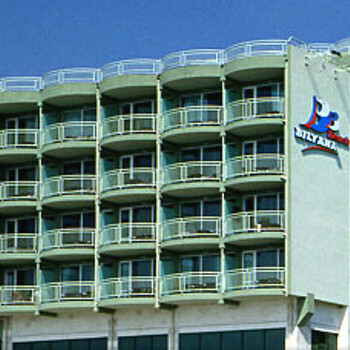 Bilyana Beach Hotel is well worth it's 4 star rating. Staff excellent, very clean, excellent location, decor & general layout very good apart from not having a toilet on the same floor as the bar, the trek involved down one floor of marble stairs was hazardous,especially at 4am!!! Weather was unfortunately not very good and hotel has no entertainment apart from TV. A trip to Khans Tent in Sunny Beach is a MUST excellent value for money. The Rep.,Steve, is one of the best tourist reps I have come across, very helpful. I will certainly go back next year. Bilyana Beach Hotel is really impressive with wall to wall marble & maintained to a high standard. Room was very comfortable with beds & towels changed every day. The Hotel had about four lifts all operated efficiently with no breakdowns. Bilyana hotel was not our initial choice (Marina Palace) tour operator changed this a week prior to departure. Hotel location from old Nessebar involved a fair hike, probably approx. 1 mile which in the heat of the day can be a bit daunting. The small approach road to the Hotel can only be described as tatty & requires improvement. Very few of the Hotel staff could speak English (other than reception) this was a problem on a few occasssions. The small lounge bar in the evening was relaxing, however no entertainment was provided. Prices of drinks although reletively cheap fluctuated depending on who was serving behind the bar. Unfortunately the hotel food can only be described as diabolical & after the first day ate out at local restaurants. Complained to the holiday rep. who acknowledged there was a problem. Suggest B & B option if you intend to stay at this Hotel.